Simply by entering checklists into the eBird online database (www.ebird.org) birders have a chance to win an iPod touch® and a free download of the BirdsEye bird-finding application. BirdsEye is the revolutionary iPhone app that harnesses the power of eBird to help users find the birds they want to see. It's not a traditional field guide for identification. It does what a traditional field guide cannot do: guide users to the places where birders are seeing birds, using fresh eBird data that are frequently updated. BirdsEye has information about 857 species in North America, including eBird sightings, sounds from the Macaulay Library, photographs from VIREO, and birding-finding tips from Kenn Kaufman. And now BirdsEye has a little brother: BirdsEye Lite. Designed for beginning birders, BirdsEye Lite features information about 135 species that are easy to find in North America north of Mexico. Designed for use on the Apple iPhone® and iPod touch®, BirdsEye and BirdsEye Lite are available on the App Store℠. BirdsEye Lite sells for $1.99 and BirdsEye sells for $19.99. The contest takes place from August 16 through September 6. Anyone who signs up at www.eBird.org (it’s free) and submits at least one checklist during this three-week period will be entered in a drawing for the touch device and a free BirdsEye download. Five runners-up will get a free app download. For those already participating in eBird, anyone who submits checklists during the contest period will be entered in a separate drawing for another iPod touch and BirdsEye download. An additional five will also receive the app for free. 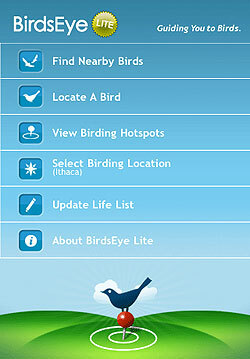 The BirdsEye Lite and BirdsEye apps were developed by Birds in the Hand, LLC, of Virginia, and bring together content from the Cornell Lab of Ornithology, the Academy of Natural Sciences, and author Kenn Kaufman. Portions of BirdsEye and BirdsEye Lite sales go to the Cornell Lab of Ornithology to help support its research, education, and citizen-science projects focused on birds, and to the Academy of Natural Sciences to support VIREO, the world’s largest collection of bird photographs.